I havent seen this thread in a while. Great work. Dont know why I never sub'd before but I am now. I was able to get the diff and suspension off and out of the way. The 8.8 housing is cut and positioned in place. I need to get some material to continue with the brackets and links. I thought I was done with a Sciatica issue, but after catching a cold and sneezing and coughing for a few days, it has returned. Will have to take a pause. Hope you feel better soon man - that's no fun. Get better quick so when you're done with the IRS set up we can LNF swap the '84 hatch and then move on to the Chevette I've got my eye on. Would be pretty trick with an ecotec RWD set up we'd need to source. Sweet, what is the axle from? Can you give us some specs? Axle is a Ford 8.8 out of an Explorer. 3:73 posi. I will be keeping the gears and all new clutch, bearings and seals. I cut most of the axle tubes out and had custom stub axles made. They bolt up to the new CV axles. The spindle is from the front of a GM W-body. Parking brakes are Corvette/Caddy. The disks are rear Buick Rendez-vous. The coil over struts are Third Gen Camaro ( AEI double adjustable). All supports and linkages are custom. Rennen from FAST. With and offset were very limited for my application. I was actually considering widening the rims I had. However, a good friend found them for me. I want to see better pictures, but yes I like them. Better pics of the rims? 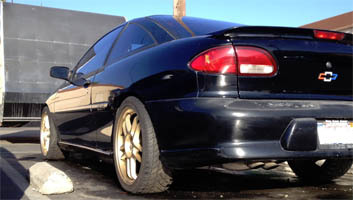 Jesus MAN what great work, makes me want to find another Z24 shell and send it to you. How much to setup a rolling chassis like yours with the 8.8 IRS and setup for a Gen II LT1 or LSx engine? The IRS is definitely a great upgrade. Going from 3:42 to 3:73 didn't hurt either. drove all last summer - dialed in nicely. Over the Holidays I upgraded the engine management system from OBDI to OBDII - GM LS Distributorless CNP. Start up this spring and final tuning on a chassis dyno to come soon after that. Nice bump to the thread. I got an email notification and got excited there was progress. Not sure how I missed the IRS update, but sweet man! Thanks for the great compliments. Sorry about the slow updates. Life is getting a little busy with buying a new house, selling ours before we take possession of the other... I'm hoping to get in the garage this weekend to wrap up the LS Ignition upgrade and actually start it. Maybe even go for a spin as it is very mild here... I want to drive it to the temp storage. Do my best to get some more pics up soon - possibly a revised walk around video. have you weight the car? The tuner mentioned if I was to swap out the wheel bearings for the ones with ABS sensors, he can use the signal to detect wheel spin. This can be used to back off the motor to increase traction. Handy if I need to drive it I the rain - I like this guy.  Also The new ignition set-up has effectively lowered the idle temps – 205 down to 185. So I picked up another hood and will have it painted. Do away with the louvers the existing hood has to further complete the sleeper look. Perhaps incorporate a tilt forward hood. I will have to put the brakes on as we sold our house and need to get packing and move to a temp location until our new home is available in July. Bigger garage – Woo Hoo. So I have decided to put the Cavy for Sale. Okay ,I'll ask. How much?It has a lot of work done for a cavalier.